Nowadays, most newly built houses are airtight. During re-building, most of gaps and holes are also made tight in order to prevent undesired heat leaks. However, a natural air circulation inside rooms is prevented this way, unpleasant smells cumulate and mould might appear. It is necessary to ensure the essential air ventilation, keeping the inevitable heat losses at a minimum level. This can be reached only by using ventilation units with heat recovery. The unit has an inbuilt heat-recovery heat exchanger in which the warm stale air transfers the most of its heat to the cold fresh incoming air. Thanks to that, warm air is not let out uselessly through an open window. Central units of a higher performance; air is distributed through pipes into individual rooms. Local units that are installed in a wall and ensure air ventilation for only the room they are mounted in. The central unit will ensure an even air exchange in the whole building. The unit brings fresh air into living areas like bedrooms or a living room via pipes, and removes stale air from stressed rooms like lavatories, bathrooms or a kitchen. AIR MINDER represents a new generation of wholehouse heat recovery and ventilation systems. It combines continuous ventilation with the most progressive heat recovery system on the market. It will effortlessly remove polluted air and unpleasant smells from your kitchen, bathrooms and toilets and provide a constant supply of clean filtered air, allowing you and your family to live in an ideal indoor environment. The optimum temperature comfort is kept and your heating cost reduced. Continuous ventilation is thus ensured even when your house is sealed (leaving for a holiday, or in recreation houses). By keeping humidity levels low and introducing warmed fresh filtered air to replace contaminated air, the quality of the internal environment is significantly improved. Constant wholehouse ventilation can reduce the relative humidity, which inhibits the ideal living and breeding conditions of the house dust mite and mould spores. 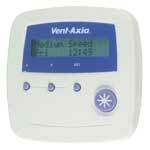 It is ideal for people who suffer from asthma, allergy, and in homes with elevated indoor radon levels. Remote controller with LCD status screen. Automatically switches between 3 speeds, slow (night), medium (day) and manually switchable boost. 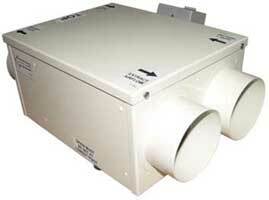 Supplied with each Air Minder unit. 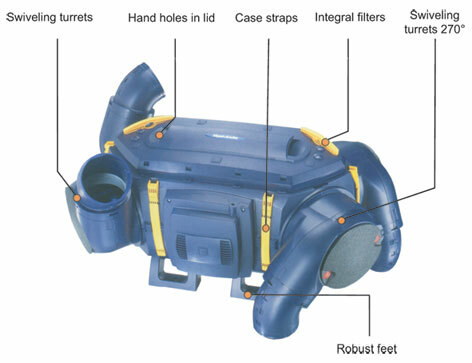 AirMinder is the best in heat recovery, it is installer friendly and fits into many different orientations with its unique ducting turrets rotating to any required angle. Thanks to its simple construction based on a mere clicking the modules together it can be easily mounted horizontally as well as vertically. Remote controller with LCD status screen. Automatically switches between 3 speeds, slow (night), medium (day) and manually switchable boost. 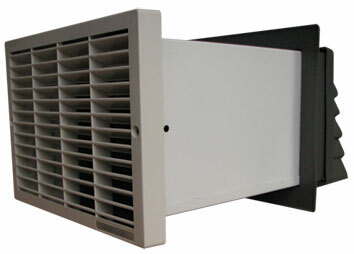 Supplied with each Air Minder unit. HR100 is a small-sized heat recovery unit intended for ventilating either apartments or just several rooms in single-family houses. The installation is very easy thanks to its small size and the unit will fit even into a very small space (a cupboard, ceiling void). 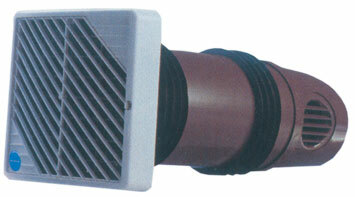 A 100mm piping is used for air distribution. The system assembly with HR100R unit is simple and fast. Local Heat Recovery Units are intended esp. for houses that undergo re-building and where only some rooms were made airtight, i.e. by window or façade renewal. It is essential to use controlled ventilation for an optimum comfort. A big advantage of these units is their easy mounting. The ventilation units are mounted directly into a wall of the space in question, so no bulky pipelines are needed, nor big building modifications. than it lets in. This difference will ensure that air from such a room will never spread into other rooms. The unit works in two modes. The low-speed mode is suitable for long-term ventilation, and the high-speed mode is intended for intensive removal of stale, contaminated air and humidity. Switching between the low- and high-speed mode can be done either by a manual switch or automatically by a humidistat, depending on the preset degree of relative air humidity. Switching can be also wired to a light switch and the high-speed mode can be switched on together with turning on a light. These heat recovery units are suitable for ventilating living space like living rooms, working rooms, bedrooms, and especially for open kitchens. These units are well pressurebalanced, i.e. they bring almost the same quantity of air inside a room as they exhaust. Sucking stale air from other rooms is so prevented. HR30W a HR100W are intended for walls of thickness up to 280mm. The extension EXT100 is made for walls 280-500mm thick. The HR 30W unit is equipped with a fine polyurethane dust filter of EU2 filtration class (suitable also for children‘s bedrooms). Thanks to its possible higher performance, the HR 100W unit is suitable also for poorly ventilated restaurants etc. Switching between the low- and high-speed mode can be done either by a manual switch or automatically by a humidistat, depending on the preset degree of relative air humidity.